The ultimate conditioner for treated, dry, textured, or normal hair with a touch of peppermint oil. It’s packed with nutrients for the ultimate in restoring life to your hair. Peppermint oil gives the scalp a cool, soothing, relaxing feeling and adds shine and manageability to the hair—never making it feel heavy. 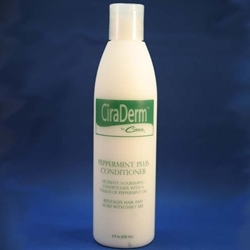 Peppermint Plus Conditioner is the ideal partner to the CiraDerm Follicleanse and Peppermint Plus Shampoos.